Bryant – The Bulldogs are billing it the “Fight for First.” On Thursday night, Robert Morris will invade the Chace Center in a battle that could wind up determining who takes the No. 1 seed in the upcoming NEC Men’s Basketball Tournament. While Robert Morris (12-4), which has appeared in each of the last four NEC Championship Games, sits in first, Bryant (11-5) is only 1.0 game back on the Colonials. The head-to-head matchup gives the Bulldogs an even better opportunity to possibly leapfrog RMU and earn home-court advantage through the postseason conference tournament. The game will air live on Feb. 28 at 7:00 pm via NECFrontRow.com. Read more. Central Connecticut – The Blue Devils have amended Saturday’s basketball schedule at Detrick Gymnasium to accommodate the NEC-TV cameras. With the NEC selecting CCSU’s impending matchup with Robert Morris as it “Final Weekend Wildcard TV Game,” the Blue Devils and Colonials have a new tip-off time of 11:33 am. The game will air live on MSG and Fox College Sports (Check Your Local Listings). As a result of the men’s change, CCSU women’s team will play at 2:00 pm. Read more. Fairleigh Dickinson – They currently lead the standings, but will that still be the case when the NEC Spring Meet is complete. Having won 13 of its first 18 NEC bowling matches, Fairleigh Dickinson has the inside track toward the NEC regular season crown. The Knights, who are the nation’s No. 7 team in the latest NTCA Top 20 Poll, will head to Strike 10 Lanes in Brooklyn to meet its fellow league members for the third, and final, regular season NEC-sponsored competition. Set for March 2-3, the NEC Spring Meet will follow a traditional team play format throughout. Read more. LIU Brooklyn – The Blackbirds’ bowling program has come a long way in its four-plus years of existence. This past weekend’s happenings provided more evidence of just how far LIU has come. Brittany Hart, Karen Diosa, Mariah Hatfield and Co. posted a first-place showing at the annual ECAC Championship meet. The Blackbirds, who are the No. 16-ranked team in America, topped tournament host Adelphi to clinch the team title on Sunday. 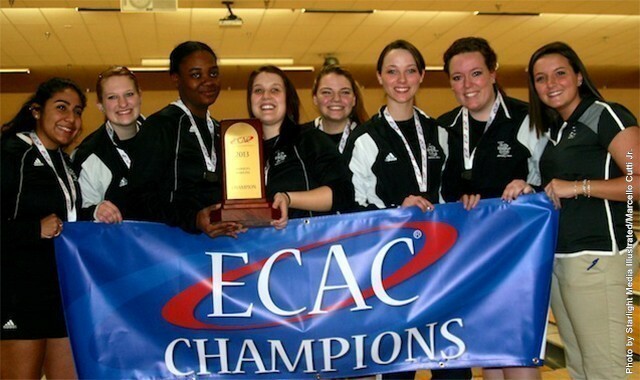 One day earlier, Hart won the ECAC Single Championship. Read more. Monmouth – King Rice and the Hawks will host Mount St. Mary’s in a Thursday night (Feb. 28) tussle at the Jersey Shore. It will be the next-to-last home game for Monmouth’s men’s basketball team, which will close out the regular season on March 2 against Wagner. Although the Hawks were officially eliminated from postseason contention last week, they can still affect the playoff race. The Mount and Wagner both have hopes of finish in the top-third of the NEC standings so that they may host NEC Tournament quarterfinal contest. Read more. Mount St. Mary’s – So, OK, nobody’s perfect! After notching two noteworthy wins over Delaware and Bucknell, the Mount came up short in its latest men’s lacrosse contest against No. 6 Virginia. The Cavaliers topped the Mountaineers, 18-11, on Tuesday night, Feb. 26 in Charlottesville. Brett Schmidt scored thrice for the Mount, which will next face Towson at home on March 2. Read more. Quinnipiac – Tricia Fabbri’s Bobcats have yet to lose this calendar year. At 25-2, Quinnipiac is making a case for an at-large bid to the NCAA Women’s Basketball Tournament. In terms of mid-major programs, the Bobcats are one of the nation’s best. The latest edition of the College Insider Mid-Major Top 25 Poll has Quinnipiac in the No. 10 spot. Read more. Robert Morris – Ashley Ravelli is becoming a household name in Northeast Conference women’s basketball circles. The Italian-born freshman won the Choice Hotels NEC Rookie of the Week award for the third time this season thanks to her latest two-game swing. Ravelli, who leads all NEC freshmen with 56 three-pointers made, averaged 16.5 points per game last week. Read more. Sacred Heart – It’s Valentine’s Day all year long at Sacred Heart University. SHU President John J. Petillo introduced former Major League Baseball manager Bobby Valentine as the school’s incoming Executive Director of Athletics. Valentine, who took the New York Mets to the 2000 World Series, will take over for the retiring Don Cook, who was recently enshrined into the NEC Hall of Fame. Read more. St. Francis Brooklyn – It’ll be a special Saturday in Brooklyn Heights come March 2. 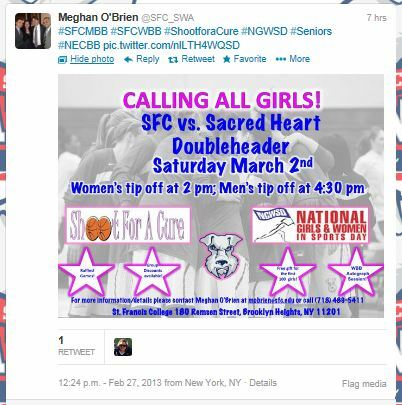 St. Francis College will host its “Shoot for a Cure” and “National Girls and Women In Sports Day” events in conjunction with its NEC hoops doubleheader. Read more. Saint Francis U – The Red Flash are heading to Boston with a title to defend. Looking for a fourth consecutive NEC Swimming & Diving team championship, Saint Francis will contest the four-day, seven-team title meet in Beantown. Individually, Elise Lofgren will take aim at her third straight gold medal in both the 100 breaststroke and 200 breaststroke. The meet opens on Wednesday night, February 27 at 7:00 pm. The 200 medley relay final is first followed by the 800 free relay final. Read more. 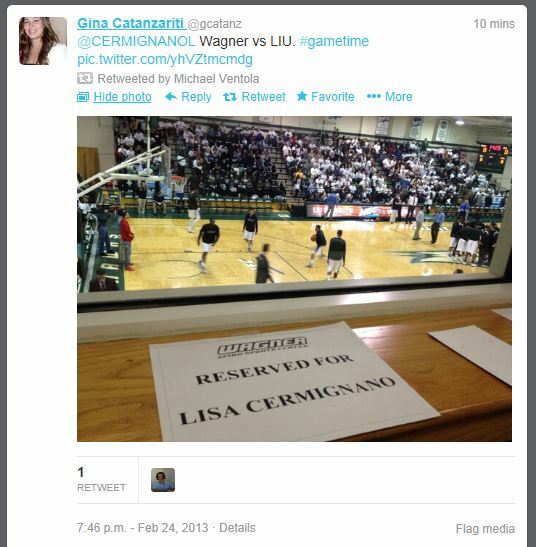 Wagner – If you weren’t watching last Sunday night, you missed a pretty good one on Grymes Hill. Wagner outlasted two-time defending NEC champion LIU Brooklyn in a marquee men’s hoops matchup that aired live on ESPNU. The nationally-televised broadcast was decided on Kenny Ortiz’s putback layup with 0.8 second remaining on the clock. Read more. Northeast Conference – The latest edition of the NEC On The Run Hoops Video Podcast is now available. This week’s show features an interview with St. Francis Brooklyn WBB head coach John Thurston, the #NEC9 and MUCH MORE! From the opening tip to game-winning bucket, this one was special. And if you were watching the Oscars, well, you missed out on one of the best NEC-TV games ever. Before a nationwide audience on ESPN (watch full game replay) local rivals and NEC contenders LIU Brooklyn and Wagner went toe-to-toe before a charged up, packed house at the Spiro Center. The game had everything you can ask for: spectacular dunks and rejections, scintillating three-point shooting, some of the niftiest passes you will see, a furious comeback, and finally, a buzzer-beater shot. Wagner used a swarming defensive effort to rally from a 13-point first half deficit and found itself with a 10-point lead with under two minutes remaining in the game. But the two-time defending NEC champs had one last push. “I won’t say I felt like we had a 10-point lead but to be honest I was extremely comfortable and confident feeling like we were going to win the game,” said Wagner head coach Bashir Mason. Back-to-back three-pointers cut the lead to 88-84, and after a number of missed opportunities on both ends, LIU junior guard Jason Brickman (San Antonio, TX/Clark) banked in a trifecta to slice the lead to one point with 34 seconds left on the clock. Wagner junior guard Latif Rivers (Elizabeth, NJ/Elizabeth (Avon Old Farms (CT)) and Brickman each hit a pair of free throws, then Rivers sank two more to put Wagner’s lead at 92-89 at the 21 second mark. Brickman brought the ball up the court and calmly sank another three to even the game at 92 with just under 13 seconds to play, setting up Wagner’s decisive final possession. Rivers took time off the clock dribbling by midcourt, drove to his left and misfired on a runner off the top of the backboard, but junior guard Kenneth Ortiz (Newark, NK/Science Park (Southern Mississippi)) was right there for the putback with 0.8 seconds showing to give the Seahawks the 94-92 win. It didn’t take long for Twitter to react. Add Wagner/LIU-Brooklyn to the Top 13 NEC Games of 2013 list! I think my head just exploded. Tie at the Oscars, madness at LIU/Wagner. All in the same few seconds. Brickman for 3!! This has been a fascinating basketball game. ESPNU getting everything it wanted from #NECMBB. 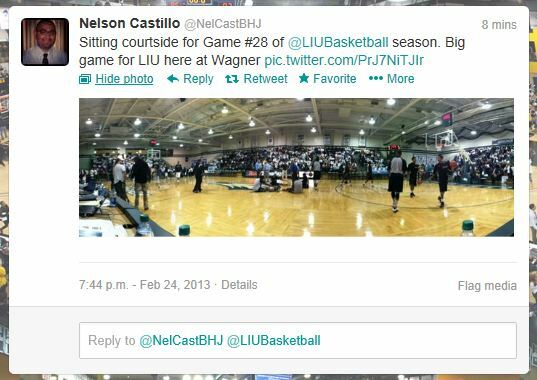 wild finish as #Wagner stops #LIU in men’s hoops tonight, 94-92…@NECSports rockin’ it! “I was just in the right place at the right time and I made the shot,” said Ortiz. For Ortiz, this wasn’t the first time he’s played the role of hero at Wagner. Last season, Ortiz hit an over-the-backboard-falling-out-of-bounds buzzer-beater to nip Santa Clara 64-62 in the championship of the Cable Car Classic. He has hit a pair of game-winners this season and four over the course of his career. It was a frenetic finish for sure. These two teams could potentially see each other again in the NEC Tournament, but to the players involved in yesterday’s clash, in a claustrophobic Spiro Center, with so much on the line, it may as well have been a playoff game. “It sounded like a championship game,” said Olasewere. Now do yourself a favor and tune into some awesome NEC hoops action on ESPNU. LIU Brooklyn will cross the Verrazano Bridge to take on Wagner before a live national TV audience on Sunday, February 24 at 8:00 pm. Bob Picozzi (play-by-play) and former Wagner head coach Dereck Whittenburg (color) will be on the call. Bryant – The preseason favorite to win the 2013 NEC baseball title opens its season in the Lone Star State. Steve Owens’ Bulldogs will contest a three-game weekend set at Houston Baptist, beginning on Friday, February 22. With the first pitch on Friday, the Bulldogs will be officially underway on their first season of full Division I eligibility. The reigning Northeast Conference regular-season champions, Bryant is coming off a season in which it was 33-21 overall and 24-8 in league play. Read more. Central Connecticut – Beryl Piper’s Blue Devils are on the rebound. After dropping five straight games, Central Connecticut posted its second win in a row on Wednesday. In a makeup game, which was originally scheduled for the weekend that Winter Storm Nemo hit, the Blue Devils topped LIU Brooklyn to even their NEC record up at 7-7. CCSU, which is currently tied for sixth place in the NEC standings, will travel to Bryant (Feb. 23) and Sacred Heart (Feb. 25) this weekend. Read more. Fairleigh Dickinson – The Knights won’t play their first game until March 1 when they visit Savannah State, but they will ceremoniously open the 2013 baseball season on Saturday, February 23. Head coach Gary Puccio and Co. will host the annual Jon Bittman First Pitch Dinner at the Park Ridge Marriott, welcoming back a number of alumni and friends of the program. Puccio will also name his Opening Day starting pitcher at the dinner with the legendary Jon Bittman presenting that lucky hurler with the ball. Read more. 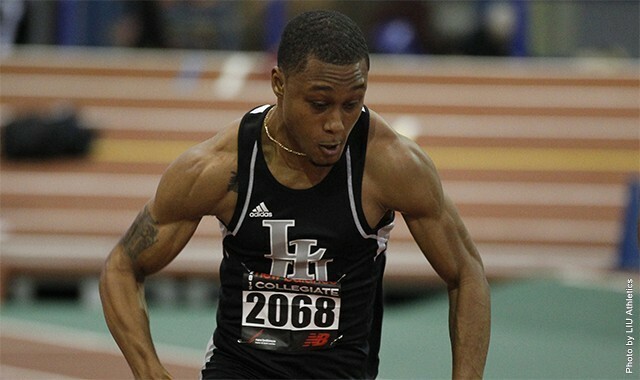 LIU Brooklyn – The names of Blackbirds were peppered all over the list of 2013 All-NEC Indoor Track & Field honorees. LIU’s men’s team garnered a league-high 10 selections, one more than 2013 NEC team champion Monmouth. Veteran sprinter Nickolei Mahlung was one of six Blackbirds to earn a spot on the All-NEC First Team. The graduate student sprinted to victory in the 60m dash at the conference title meet earlier this month, tying the NEC record (6.77) originally set by Sacred Heart’s Arman Dixon. Read more. Monmouth – The Hawks opened their 2013 baseball slate by posting a 7-6 win over Villanova on February 15, but saw the rest of its weekend at the Ron Fraser Classic washed out. This weekend, Monmouth will hope for better weather in Nashville, TN as Dean Ehehalt’s club takes on SEC member Vanderbilt. The Hawks and the No. 4 Commodores will play a three-game weekend series that begins on Friday, February 22. Read more. Mount St. Mary’s – Jamion Christian’s Mountaineers are on fire, causing mayhem for their opponents on the hardwood. Playing their high-energy style, the Mountaineers topped two-time defending NEC champion LIU Brooklyn, 83-71, to extend its win streak to four. With the postseason tournament looming , the red-hot Sam Prescott and his mates will look to further strengthen its NEC standing when they host St. Francis Brooklyn on Saturday, February 23. The game, which will air live on www.necfrontrow.com, will be the final home date on the Mount’s regular season schedule. Read more. Quinnipiac – Less than two weeks removed from the Bobcats’ highest team finish in their history at the NEC Women’s Indoor Track & Field Championships, head coach Carolyn Martin received some rightful recognition. The NEC named Martin its Women’s Indoor Coach of the Year after Quinnipiac cracked the top half of the team standings for the first time in 14 years at the meet. Read more. Robert Morris – The Colonials will welcome Garden State-based Fairleigh Dickinson and Monmouth to western Pennsylvania for a pair of crucial women’s hoops contests this weekend. Robert Morris, which will celebrate its Senior Day against FDU on Feb. 23, sits at 6-7 in NEC play. That mark places them one-half game behind Bryant for the eighth, and final, spot in the upcoming NEC Tournament. Read more. Sacred Heart – One of the more intense rivalries NEC women’s basketball has known over recent years will be renewed come Saturday, February 23. Sacred Heart, the defending NEC champion, will host intra-state rival Quinnipiac. Although SHU is the team coming off its third conference crown, Quinnipiac earned the moniker of NEC preseason favorite and has yet to lose to a league foe this year Tricia Fabbri’s Bobcats (14-0) defeated Sacred Heart, 74-45, earlier in the season on January 12 in Hamden. Now, the scene shifts to Fairfield where Sacred Heart has proven tough to beat. The Pioneers are 11-1 at home. Read more. St. Francis Brooklyn – The Terriers are no longer on the outside looking into the NEC men’s basketball postseason picture. St. Francis moved into eighth place in the NEC standings thanks to a last-second win over Verrazano Bridge rival Wagner on Thursday night, February 21. With the Terriers trailing by one in the game’s waning moments, senior guard Dre Calloway made his move to the basket and converted a layup with 2.8 seconds remaining to lift the hosts to a 76-75 win. Read more. Saint Francis U – The Red Flash were the runner-up at the 2012 NEC Men’s Soccer Championships, but they’ve added some new faces who could help them get over the hump. Head coach Michael Caspar announced the addition of seven newcomers, who will join the program in time for the 2013-14 campaign. These seven young men represent five states, two countries and all four major positions on the field. Read more. Wagner – The Seahawks welcome Verrazano Bridge rival LIU Brooklyn to Staten Island on Sunday, February 24 and the ESPNU television cameras will be there to catch the action unfold. Wagner will host the defending NEC champions in an ever-important men’s basketball matchup. The two teams are separated by one game in the standings and are both vying for a top-four finish in hopes of securing the right to host a NEC Tournament quarterfinal game. Read more. There are just two weeks remaining in NEC play, and to say it’s crowded at the top would be an understatement. But while January brought us a number of surprises, the race to the finish in February has an air of familiarity. Look no further than the two teams tied for first place. Two rivals, linked by their common success, once again at the top of the pack in the NEC. 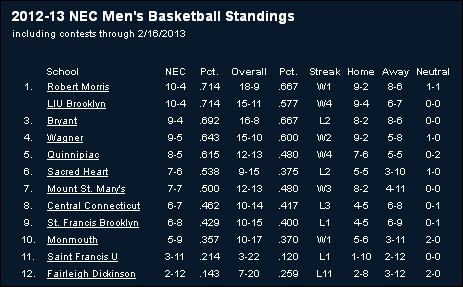 LIU Brooklyn and Robert Morris enter play this week tied for first place with 10-4 NEC marks. The Blackbirds have won four straight and are 10-1 in their last 11 games following an 0-3 start. “Our guys have been resilient,” said LIU head coach Jack Perri after Saturday’s win over FDU. “They keep their poise and we still have a lot of seniors, and that’s big. Likewise, the Colonials are 10-2 in their last 12 outings. Should the two teams wind up in dead heat at season’s end, the tiebreaker would go to RMU by way of its 60-57 win over LIU on February 2. But by no means is their lofty perch secure. And that’s because they have company, and plenty of it at that. Within one game of the two NEC powers are Bryant, a half-game back at 9-4, followed by Wagner (9-5) and Quinnipiac (8-5). So not only is the race for the NEC regular season title looking like a classic battle, but the race for a top-four spot could be epic. In the NEC Tournament, a top-four spot guarantees a team a home game in the quarterfinals, so the difference between being the four and five seed is huge. This isn’t the case in leagues in which the tourney is contested at a neutral site. Entering play this week, Quinnipiac and Wagner are straddling the four-five line, and both teams are red-hot after weekend sweeps. Quinnipiac has won six of its last seven games, while the Seahawks have won six-of-eight. Both squads are nipping at the heels of Bryant, which had led the league all season until falling twice on the road last week. The Bulldogs still have to make up a game with Sacred Heart, which accounts for the half-game separation in the standings. Bubbling under is another white hot team in Mount St. Mary’s (7-7 NEC). Mount Mayhem ran wild last week with a huge win over Bryant (84-70) on Thursday, followed by an NEC-TV victory over CCSU (89-80) two days later. The Mountaineers, who hit 26 three-pointers in the sweep, have won three in a row and five-of-six to pull to within a half-game of sixth place Sacred Heart (7-6). And then there is the battle for inclusion, otherwise known as a top-eight spot in the standings. CCSU currently owns the key to the final NEC Tournament spot with a 6-7 record, but St. Francis Brooklyn is just a half-game behind at 6-8. And then there is 5-9 Monmouth, which scored a huge 73-64 win over the Terriers on Saturday to stay right in the mix. We’re headed down the backstretch, just 16 days away from the start of March Madness. It promises to be a wild ride getting there.